I was chatting the other day on twitter about the Neiman Marcus/Target partnership, and why they decided to partner up. I don't really see the benefit, but someone suggested perhaps it was a way for Target shoppers to splurge or indulge without feeling the wallet-pain of indulging at an actual Neiman Marcus store. Tis the season to indulge, right? Cookies to the left, cocktails to the right (sparkling water for me)...chocolate chocolate chocolate. Other indulgences slip into our subconsciousness, whispering, urging us to buy every fancy thing in sight. When I indulge myself in a little something fancy it usually ends up being skin care. I don't really know why, but I suspect it's because I put everything else before the priority to take care of myself (acceptance is the first step). It doesn't hurt that winter weather dries my skin out and makes me feel especially blah, or that this year my hormonal, bloated, pregnant-self can't get enough sleep, and my entire epidermis should be called epidullmis. I used to use Benefit make up while actively ignoring their ingredients. These days I'm on the search for brands that contains fewer preservatives. 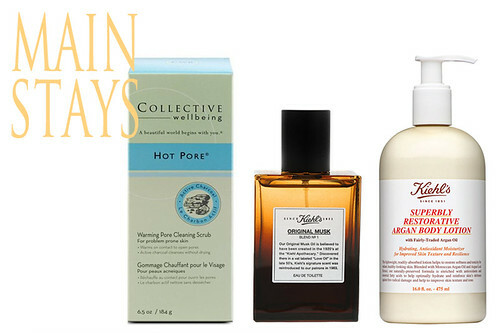 If I love something, I go back to it again and again, so there are a few mainstays in my not-quite-routine: Collective Wellbeing Hot Pore scrub, Kiehl's Superbly Restorative Argan Lotion and their Musk Eau de Toilette. 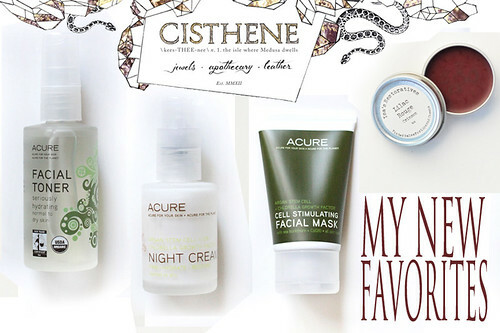 Those mainstays were recently supplemented them with this year's indulgence: Acure toner, night cream, and facial mask. To round off my order, I added Isa's Restoratives Lilac Rouge to replace the Benefit Benetint I've been so fond of (bye bye parabens). My Cisthene total was less than the cost of a new outfit, and 10 minutes with my skin every evening and we at peace again. Of course, finding make-up might be a little trickier. Anyone have a favorite brand? I've been eying Tarte... Do you indulge? What's your favorite personal treat?